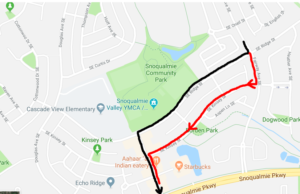 Beginning 6/28/2018, City of Snoqualmie will be having Music in the Park every Thursday. The closures are from 3pm to 10PM. Dates for road closures are: 6/28, 7/12, 7/26, 8/9, 8/23 and 9/6. This will affect the last run of the day for the Snoqualmie Ridge Loop. The three o’clock loop will be rerouted. See attached map.